It’s the start of a new year and we’ve already been busy looking at fundraising projects for 2018. Mother’s day is only a few weeks away, so now is the time to start planning your project. We have terrific tea towels, marvellous mugs, creative coasters and brilliant bags too! 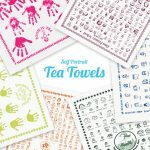 Our Tea Towels start from just 50 per design with a range of bold print colours, making them an ideal project for playgroups, pre-schools and nurseries as well as primary schools. There’s lots of different borders to choose from as well including special seasonal and personalised borders. Tea Towels can be designed for any event or fundraising which is why they’re still so popular. 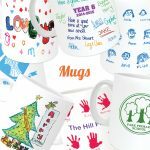 Mugs are a great project for Mother’s Day, Father’s Day and Leavers too. Each child can create their own unique design which wraps around the mug. Logo Mugs are perfect for schools who are celebrating an anniversary or another special event. We can even help to add the year or some text to your design. Our Leavers mugs are increasingly popular as they’re a great way to commemorate the end of Year 6 with signatures from children and teachers. 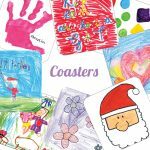 Individual Coasters are a perfect project for all age groups, allowing children to create a colourful unique design for any event. We even offer parents a choice of a single, 4 pack or 6 pack when ordering, making this project even more flexible. Our self-portrait Eco Bags are printed and also made in the UK. This allows you to select short or long handles as well as a choice of 8 different handle colours to match your design to your school colours. 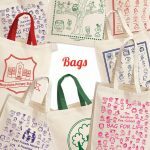 We print on both sides of our bags at no extra charge and even have a gusset bag option if you’d like a slightly larger bag. If you are putting all of the children on one design you will need one Art Pack. If you are doing multiple designs please let us now how many packs you need. Class Fundraising Marketing - Are you happy for Class Fundraising to contact you by email regarding fundraising school products. We do this a maximum of 3 times per year.